Home Android TV Boxes Amlogic S912 vs S905: Which Chipset is Best? Amlogic S912 vs S905: Which Chipset is Best? Amlogic is one of the biggest chipset manufacturers for Android TV boxes, with some of best Android TV boxes packing their processors. 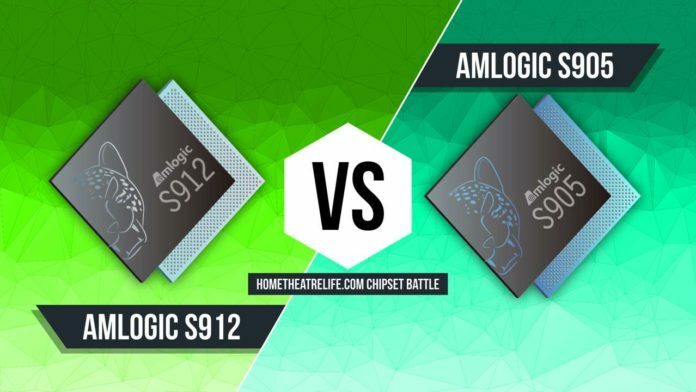 The Amlogic S912 and Amlogic S905 family of processors are the most common so it’s only natural that we’d want to know which chipset reigns supreme when it comes to the S912 vs S905. Amlogic S905X: Similar to the Amlogic S905 but adds support for [email protected] VP9 hardware decoding, hardware decoding, HDR, HDMI 2.0a and a built-in DAC. Amlogic S905L: Similar to the Amlogic S905X but supports HDMI 2.0b while missing VP9 decoding, a camera interface and TS inputs. Amlogic S905D: Similar to the Amlogic S905X, with an added DVB interface. Amlogic S905Z: Similar to the Amlogic S905X but there is limited information about how it differs. There are also -H variants (such as the Amlogic S905-H that appears in the Xiaomi Mi Box) which includes the appropriate Dolby/DTS licences to allow Dolby support in all apps. Meanwhile, the Amlogic S905 features a more typical quadcore configuration, with 4 ARM Cortex-A53 cores running at up to 1.5GHz. 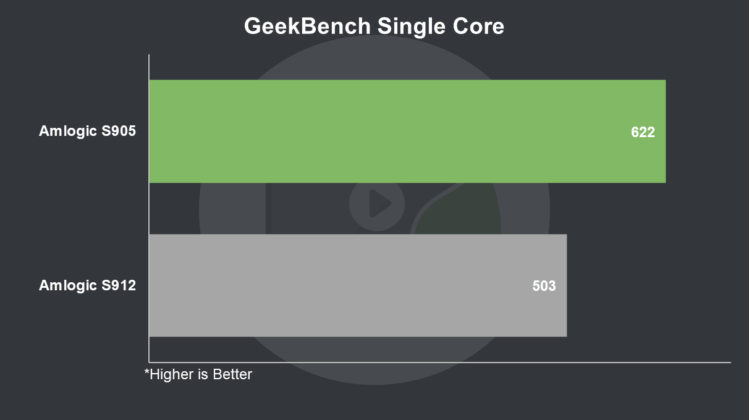 This difference translates to a decent performance gap between the two processors, with the more expensive Amlogic S912 showing 26% higher performance vs the Amlogic S905 in multicore benchmarks. This means that you’ll see better performance on an Amlogic S912-powered Android TV box, including faster app loading times, smoother UI and more. The Amlogic S912 and S905 offer excellent video playback capabilities, with the two platforms offering similar support for the most popular video formats. Both chipsets have the ability to decode Ultra HD 4K video content at up to 60 frames per second for H.264, H.265, and VP9 (though only on the S905D/S905X variants), in addition to full HD playback of VC-1, MPEG-1/2/4, and VP8 videos are also supported. Support for High Dynamic Range video (HDR) in HDR10 and HLF formats are also supported when connected to compatible TVs for improved picture quality. Encoding is stronger on the Amlogic S912, with 1080p H.265 video encoding supported whilst the Amlogic S905 family are restricted to the older 1080p H.264 format. As with general performance, there’s a big difference in gaming performance between the Amlogic S912 and Amlogic S905. 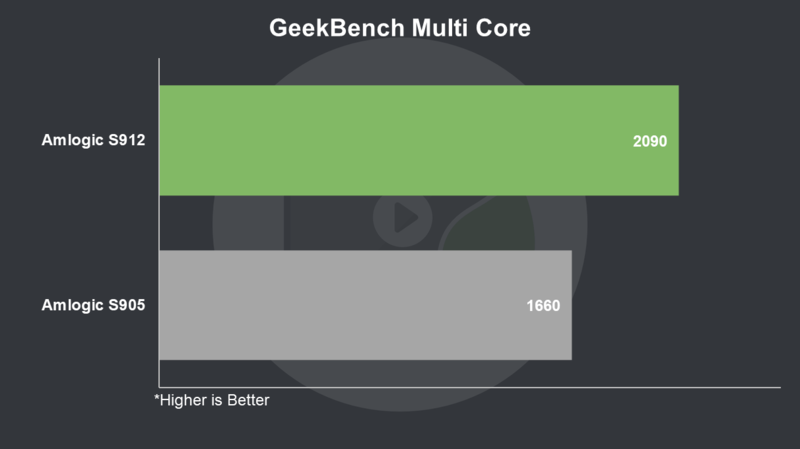 The Amlogic S912’s tri-core ARM Mali-T820 GPU is much more powerful compared to the much weaker pentacore ARM Mali-450 inside the Amlogic S905. In real world performance tests, the Amlogic S912 offers an excellent gaming experience with most games running well at playable framerates. However, gaming performance of the Amlogic S905 is average. 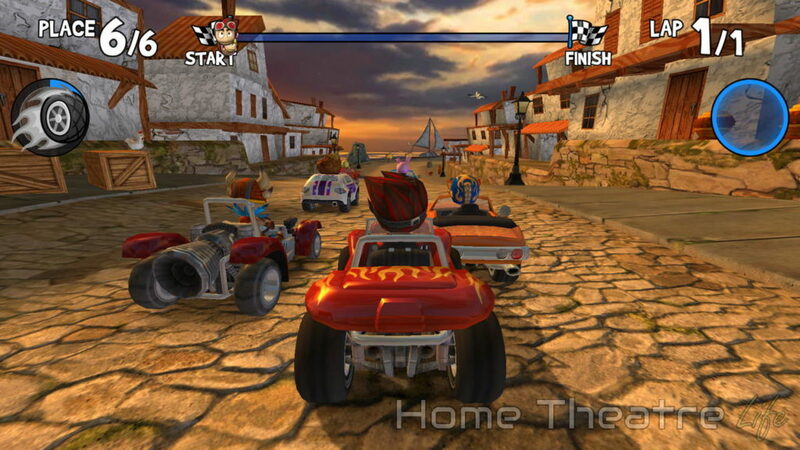 Whilst 2D games won’t pose any issues, you’ll probably need to lower graphic settings on 3D titles to keep gameplay smooth. Whilst synthetic benchmark scores don’t always match up with real-world performance differences, they are an easy way to show differences between two chipsets. 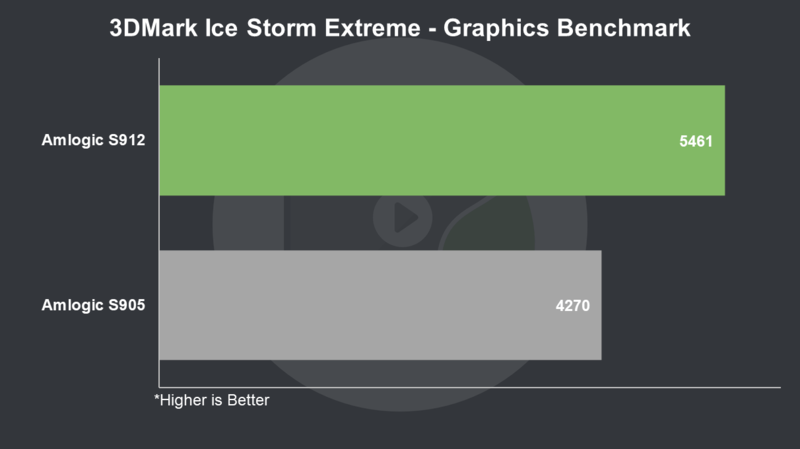 These benchmarks have been run on dozens of Android TV boxes with each chipset, with results being averaged out to account for TV box differences such as firmware. Looking at the benchmark gallery, we can see the Amlogic S912 outperforms the Amlogic S905 in pretty much all tests. Interestingly, the Amlogic S905 did appear to have slightly higher single core performance which is unexpected. In terms of GPU performance, the Amlogic S912 predictably outperforms the Amlogic S905 by a wide margin which matches up what I’ve seen when running real-world gaming tests. 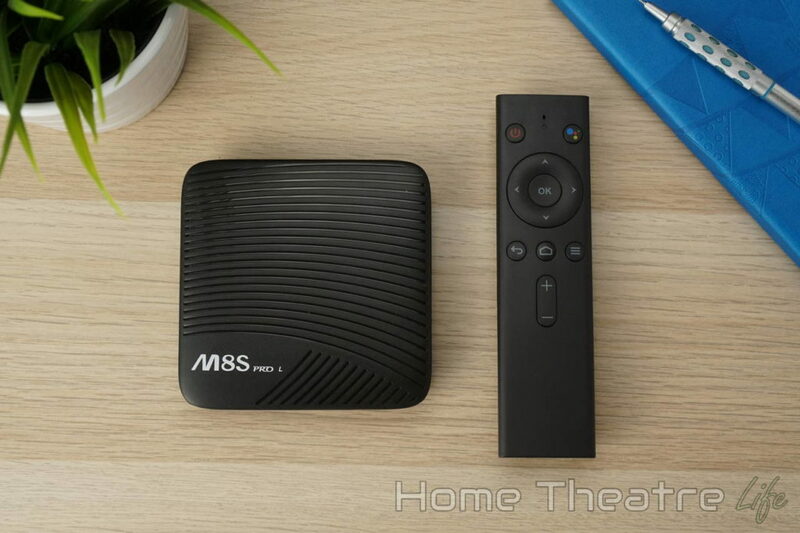 If you’re looking for a dedicated media player, an Android TV box packing either the Amlogic S912 or S905 will cover you due to similar media playback capabilities. However, if you’re wanting better overall performance or want to play games on your TV box, the Amlogic S912 is your best option. In the battle of the Amlogic S912 vs S905, the Amlogic S912 is the winner! There’s actually quite a few strong choices when it comes to Amlogic S905 boxes and I found it difficult to choose between the popular Xiaomi Mi Box and the impressively flexible WeTek Hub. The Xiaomi Mi Box (review) is packing the quadcore Amlogic S905X-H so Dolby licences are included for improved audio compatibility. It also has 2GB of DDR3 RAM, an (admittedly small) 8GB of onboard storage, dual band wireless AC and Bluetooth 4.0. It also runs Android TV so you’re getting an excellent TV-optimized experience out of the box including remote-friendly versions of Netflix and YouTube. The included voice remote also grants you access to the Google Assistant, allowing you to search for content, ask questions and more with just your voice. Netflix users will also be happy with support for 4K Netflix out of the box for improved picture quality on supported TVs. 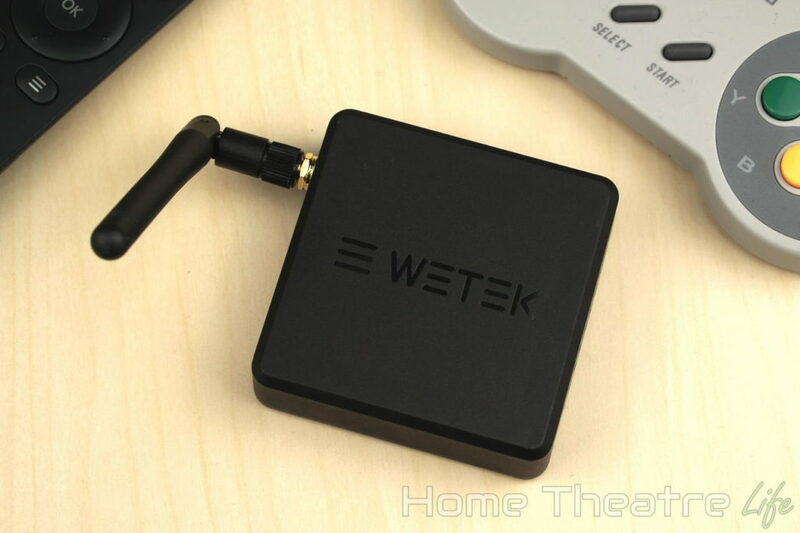 The WeTek Hub (review) offers similar specs as the Xiaomi Mi Box, with the quadcore Amlogic S905-H, 8GB of internal storage, dual band wireless AC, gigabit Ethernet, and Bluetooth 4.0. The 1GB of DDR3 RAM is disappointing however the WeTeK Hub can run LibreELEC for an appliance-like Kodi experience including support for advanced features such as automatic framerate switching. HD Netflix is also supported, with 1080p video playback possible which is much higher than the 480p most Android TV boxes are limited to. I was impressed with the Mecool M8S Pro L when I reviewed it earlier this year so it’s not surprising that it’s become one of the best Amlogic S912 boxes available at the time of writing. 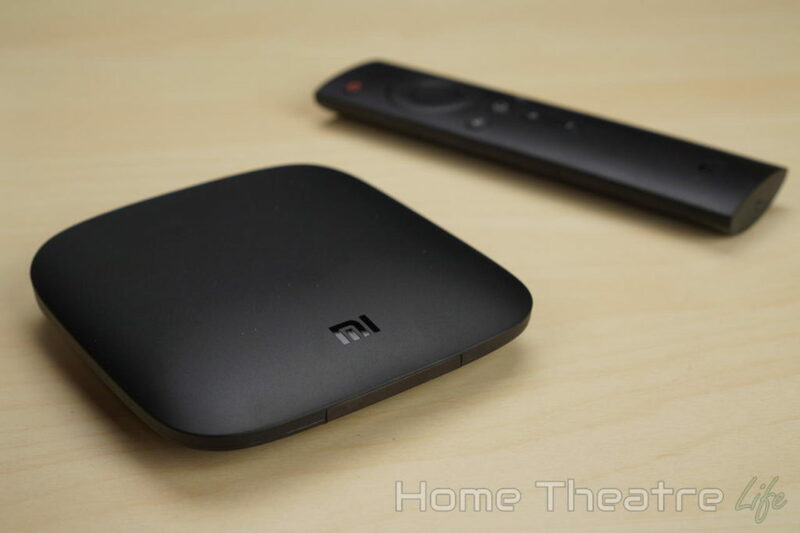 It’s one of the few Chinese Android TV boxes that run Android TV. Google’s TV-friendly OS offers a far better user experience than the interfaces that come with most TV boxes. The rest of the specs are solid too with 3GB of RAM, up to 32GB of onboard storage, dual band wireless AC, 100M Ethernet and Bluetooth 4.1. The included voice remote lets you access the Google Assistant whilst support for Google’s Widevine L1 DRM means that you’ll get 1080p Netflix streaming out of the box.